Maple-Infused Old Fashioned - San Diego Dining Dish! Just in time for the holidays, Uptown Tavern has concocted this amazing recipe for a new spin on my favorite cocktail, the Old Fashioned. Infusing the taste of delicious Woodford Reserve Maple Syrup into the already yummy Woodford Reserve bourbon, this drink could be dangerous! Here is the recipe. 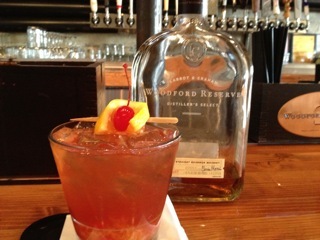 In a double Old Fashion glass, add syrup, orange, cherries and Woodford Reserve. Garnish with an Orange Wheel and cherry.